The little riddler : with many engravings. 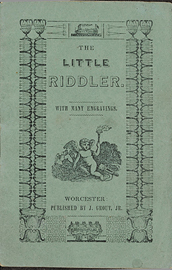 The little riddler : with many engravings. Worcester [Mass.] : J. Grout, Jr., [1844 or 1845]. J. Grout, Jr., [1844 or 1845]. "J. Grout, Jr. ... 199 Main Street, Worcester." Jonathan Grout published at this address in 1844 and 1845--Cf. 19th century Amer. children's book trade directory (AAS website). First sentence: "We are little airy creatures, All of different voice and features; One of us in glass is set; One of us you'll find in jet; One of us is set in tin; And the fourth a box within; If the last you should pursue, It can never fly from you." Copy in McGill Library's Rare Books and Special Collections: title vignette; 1 full-page woodcut; numerous woodcuts in text. Green decorated wrappers. Adelphi Book Shop. Victoria, B.C. Dec/69. $6.50. Hobbyhorse Books. Ho Ho Kus, N.J. - '91 - $150.00. Given to McGill 2001.
text.chapbook.black and white, 15 x 10 cm.